Huzaifah, M. R. M., Sapuan, S. M., Leman, Z., and Ishak, M. R. (2019). "Comparative study of physical, mechanical, and thermal properties on sugar palm fiber (Arenga pinnata (Wurmb) Merr.) reinforced vinyl ester composites obtained from different geographical locations," BioRes. 14(1), 619-637. Sugar palm fibers (SPF) reinforced vinyl ester (VE) composites were prepared in this study. The SPFs were obtained from three different geographical locations: Kuala Jempol (Peninsular Malaysia), Tawau (West Malaysia), and Tasik Malaya (Indonesia). The SPFs were utilized as reinforcement material with a fixed loading of 10 wt.%. The reinforced VE composites were prepared using a wet lay-up compression moulding method. The physical properties examined were water absorption, thickness swelling, and moisture content. To determine the strength of the SPF composites, tests on the tensile, flexural, and impact strength related to mechanical properties were completed. A thermogravimetric analysis (TGA) was completed to observe the thermal properties. This study confirmed that the properties of the composites were affected by the strength of the fiber. 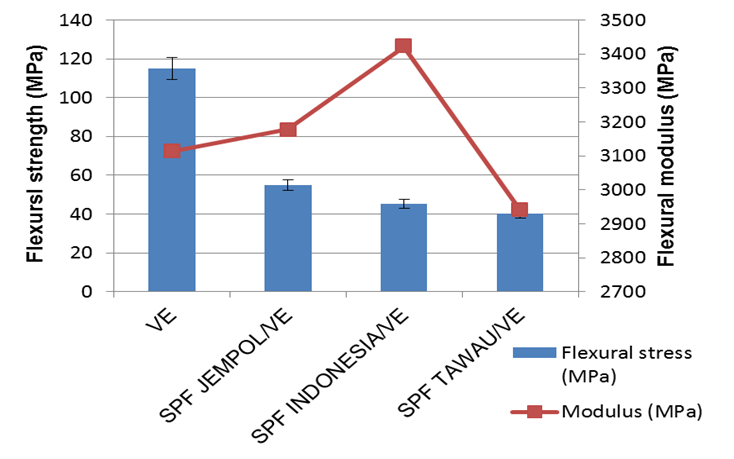 The SPF/VE composites obtained from Kuala Jempol had the highest tensile, flexural, and impact strength compared to the SPF/VE composites from Indonesia and Tawua. In addition, SPF Jempol/VE also recorded the highest percentage of water absorption, thickness swelling, and moisture content. A comparison of thermal properties showed that SPF Tawau/VE had highest percentage of mass loss between fibers from the three geographic locations. Green composite materials have been developed to reduce environmental problems and dependency on glass fiber. Natural fiber, an alternative to glass fiber, is used as a reinforcement material in composites because of its mechanical and physical properties that include flexibility, stiffness, renewability, light weight, and biodegradability (El-Shekeil et al. 2012; Ramesh et al. 2013). In addition, natural fibers are abundant, non-abrasive to equipment, and require less energy for processing. Various types of natural fibers can be used as reinforcement in polymer composites, such as jute, kenaf, ramie, bamboo, hemp, banana, oil palm fibers, and sisal. In this study, sugar palm fiber (SPF; also called ijuk) from Arenga pinnata) trees was used to reinforce a polymer matrix in vinyl ester (VE) composites. Ijuk is a black fiber that covers the tree and can be extracted directly without a secondary process to yield the fibers (Leman et al. 2008; Sahari et al. 2012b). Other products of ijuk fiber are brushes, broom, paintbrushes, doormats, rope, carpet, and septic tank base filters. Previously, many studies related to SPF composites have been conducted. Leman et al. (2005) studied the impact properties of SPF reinforced epoxy composites between chopped and long fibers. The long fibers have the highest impact strength compared to chopped fibers, and the use of SPF as reinforcement improves the impact resistance. Sastra et al. (2006) studied the tensile properties of SPF reinforced epoxy composites with three different orientations. The results indicated that woven roving fiber has a better adhesion between the fiber and matrix compared to the long random fiber and chopped random fiber orientations. Leman et al. (2008) conducted research on the moisture absorption behaviour of sugar palm reinforced epoxy composites with two different fiber compositions that were 10 wt% and 20 wt%. They concluded that composites with 20% fiber loading recorded the highest amount of moisture. Ali et al. (2010) prepared SPF reinforced epoxy composited by using 10 wt% fibers to study the effect of aging on the composites concerning their mechanical properties. The aged fiber improved the tensile strength of the composites and believed that the aging process causes the composites matrix to become more compact, which can lead to denser and harder products. Flexural properties of alkaline treated SPF reinforced epoxy composites (Bachtiar et al. 2010) and tensile properties of alkaline treated SPF reinforced thermoplastic polyurethane composites (Mohammed et al. 2016) were previously studied. However, no study has determined whether SPF from different locations influences the properties of the fiber-reinforced composites. Table 1 shows experiments that have been conducted using SPF as reinforcement with various matrix types. However, no study has been reported using SPF as a reinforcement and VE as a matrix resin. The VE has similar mechanical properties to epoxy resin, particularly concerning hydrolytic stability. In addition, VE is easy to handle at room temperature compared to epoxy resin, which offers greater control over cure rate and reaction conditions. Using VE as a matrix resin may also improve the dimensional stability, chemical resistance, strength, and stiffness of the composites. In addition, the filler reinforcement was needed to increase the performance and reduce the cost of the resin (Ku et al. 2014). According to Aprilia et al. (2014), VE costs less than epoxy resins. Therefore, the objective of this study was to determine the SPF properties from three geographical locations reinforced by VE composites concerning their mechanical, physical, and thermal properties. The SPFs or ijuk fibers were prepared according to previous work (Huzaifah et al. 2017). The SPFs were obtained from three different geographical locations: (1) Kampung Kuala Jempol, Negeri Sembilan, (2) Kebun Rimau Sdn Bhd, Balung River, Tawau, Sabah, and (3) Kampung Naga, Tasikmalaya, Indonesia, as shown in Fig. 1. According to the website Weather Spark (2017a, b, c), the average weather in Tawau is warm, oppressive, and overcast with temperatures varying from 23 °C to 31 °C . The climate in Kuala Jempol is hot, oppressive, and overcast with temperatures varying from 22 °C to 32 °C. The climate in Tasikmalaya is similar to Tawau with temperatures varying from 20 °C to 31 °C. According to the website Climate Data (2015a, b, c), the average rainfall in Tawau is 1966 mm, in Tasikmalaya is 3442 mm, and in Kuala Jempol is 1940 mm. The general soil properties for the three location is shown in Table 2. In this experiment, matured sugar palm trees (after undergoing the flowering stage with an age older than 6 years) with the height of 15 m were selected from each location. The fibers were all collected from the trunk of the tree. The fibers were washed and air dried for 24 h before being dried in the oven at 85 °C for another 24 h. Finally, the fibers were ground and segregated using an automatic shaker sieve. The range of length sizes was between 100 µm to 425 µm to create composite samples. All of the fibers were labelled as SPF from Kuala Jempol, SPF Tawau, and SPF Indonesia. The thermosetting resin used in this study was vinyl ester (VE) resin. Methyl ethyl ketone peroxide (MEKP) was used as a hardener. The VE and MEKP were obtained from Chemrex Corporation Sdn. Bhd., Balakong, Malaysia. A wet lay-up compression moulding process was used for the sample preparation of SPF reinforced VE composites. A rectangular mould constructed of an aluminium sheet with a certain dimension was used for the composite samples. The SPF percentage used in the composites was 10 wt%. The composite samples were prepared by mixing 10 wt% of SPF and 87.5 wt% of VE. First, the SPF was gradually added to the VE resin and stirred using a mechanical stirrer at 100 rpm to 250 rpm until the mixture was uniformly distributed. Then, 2.5 wt% of MEKP was added to the composite mixture for curing. Finally, the mixture of the SPF and VE resin were poured into the aluminium mould and were pressed by a cold press machine and left to cure at room temperature for 24 h. The samples were cut from the cured composites into certain dimensions according to the ASTM standards for the tensile test, flexural test, and impact tests, as detailed below. The water absorption percentages of the sugar palm fibers were determined using Eq. 1. Three samples (10 mm × 10 mm × 3 mm) were prepared and each sample was replicated five times. The samples were weighed first before being immersed (W0) in fresh water for 24 h at room temperature. After 24 h of immersion, the samples were weighed again (W1). The moisture content was evaluated based on a method used by other research group (Yusriah et al. 2014; Nadlene et al. 2016). Three samples (10 mm × 10 mm × 3 mm) were prepared, and each test was replicated five times. The samples were weighed before being heated (M0) in an oven for 24 h at 105 °C. After 24 h in the oven, the fiber was weighed again (M1). Moisture content was calculated using Eq. 2. The thickness swelling testing was conducted based on a method used by another research group (Sahari et al. 2012a). Three samples (10 mm × 10 mm × 3 mm) were prepared, and each sample was replicated five times. The average value was taken as the final result. The initial thickness (T0) was taken first before being immersed in fresh water for 24 h at room temperature. After 24 h of immersion, the final thickness (T1) was taken. Thickness swelling was calculated using Eq. 3. A tensile test is a method to determine the mechanical strength of natural fibers. Several mechanical properties can be obtained from the tensile test such as tensile stress, tensile strain, maximum elongation, and Young’s modulus. An INSTRON 5556 (Norwood, MA, USA) was used to obtain the SPF tensile properties and was tested according to ASTM D 5083 (2002). The samples were prepared with dimensions of 250 mm x 25 mm x 3 mm. The gauge length of the SPF samples was 150 mm, and the cross-head speed was 5 mm/min with a 5 kN load cell. To perform the test, three samples of SPF/VE from each location with five replications of each sample were prepared. The flexural test was conducted according to ASTM D-790 (2010) at room temperature. The test was carried out on three samples of SPF/VE from each location with five replications of each sample using a universal testing machine (INSTRON 5556) with a 5 kN load cell and crosshead speed maintained at 2 mm/min. The samples were prepared with dimensions of 127 mm x 12.7 mm x 3 mm. The support span length was set at a ratio of 16:1 to the thickness of the samples. The thermal degradation behaviour of the composites was analysed by TGA with respect to weight loss due to increased temperatures. The TGA was performed with a Q series thermal analysis machine from TA Instruments (New Castle, DE, U.S.A.). The analysis was carried out in aluminium pans under a dynamic nitrogen atmosphere in temperature range of 25 °C to 900 °C at a heating rate of 10 °C/min. The morphology of the fiber surface was observed under scanning electron microscope (SEM) instrument model Hitachi S-3400N (Kyoto, Japan). To obtain cross-sectional morphology of the SPF, the fibers were immersed in liquid nitrogen to harden. Afterward, the samples were coated with a thin layer of gold. The acceleration voltage was 15 kV, and the distance to examine the sample was 50 mm. Figure 2 shows the percentage of water absorption and thickness swelling of the SPF/VE composites from three different geographical locations. The water absorption test calculated based on the weight of the specimens before and after water immersion for each day until day 7. The thickness swelling was calculated based on the thickness of the specimens before and after water immersion for each day until day 6. Based on the Fig. 2 below, the SPF Jempol/VE recorded the highest percentage of water absorption and thickness swelling, and this was followed by SPF Tawau/VE and SPF Indonesia/VE. As shown in Table 3, these results were supported by previous research on single fiber tensile tests in which Kuala Jempol fiber had the highest water absorption, 161.96 ± 34.04%, while Tawau and Indonesia were 156.56 ± 19.64% and 80.32 ± 13.3%, respectively (Huzaifah et al. 2017). According to Sahari et al. (2011), water absorption, thickness swelling, and moisture content are affected by the hydrophilic behavior of the natural fibers and not by the hydrophobic behavior of the polymers. All lignocellulosic materials that consist of cellulose, hemicellulose, and lignin contribute to water absorption behavior. These elements contain -OH groups that attract water molecules. Therefore, when a composite containing lignocellulosic material applied in moist areas, the composite will absorb water (Sahari et al. 2011). Several natural mechanisms in water transportation allowed the water to penetrate into the natural fiber reinforced composites. Small cracks in the polymer matrix allowed the water molecules to infiltrate, while inward diffusion of water molecules occurred when there were microgaps between the polymer chains. In addition, the capillary effect could have transported water through the fiber/matrix interface. These conditions may have caused undesirable changes or deformation in the mechanical properties, such as plasticizing, swelling, or degradation. In addition, this hydrophilic behaviour causes difficulty in attaining adhesion between fiber/matrix composites, which weakens the composite product in applications (Nguong et al. 2013). Therefore, water absorption and thickness swelling on natural fiber reinforced composites are important factors to be considered in product applications. These results were supported by previous findings on single fibers, in which the relationships between holocellulose content and water absorption affect behaviour (Huzaifah et al. 2017). Previous research has indicated that SPF obtained from Kuala Jempol has the highest holocellulose content (54.5%) that contributes to the highest water absorption (161.96 ± 34.04%), followed by Tawau and Indonesia, as shown in Table 4. The water absorption and thickness swelling for selected natural fiber reinforced composites Kenaf/PP, Acacia/PP, Banana/PP, and EFB/PP were compared in Table 5. The SPF/VE had slight similarity in water absorption with Kenaf/PP and Acacia/PP, which was in a range of 1.30% to 1.60%. For SPF/VE, the thickness swelling was low compared to other natural fiber composites, which were below 0.65%. 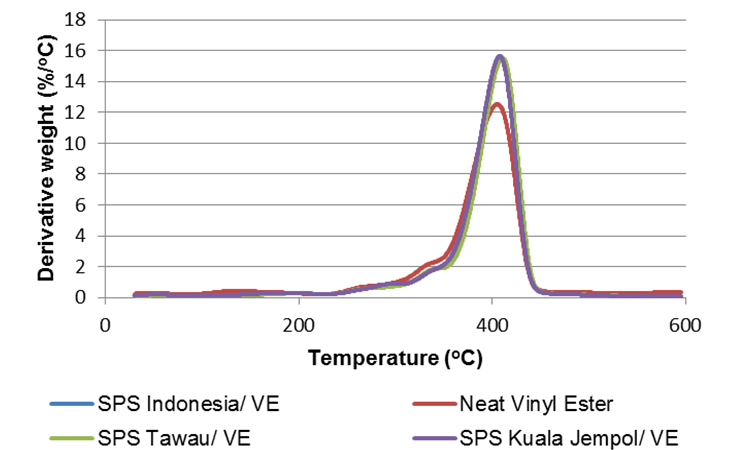 Figure 3 shows the percentage of moisture content of the SPF/VE composites from three different geographical locations. Moisture content is one of the important properties that must be considered when using natural fibers as reinforcement in material composites. Natural fiber with high moisture content may reduce the tensile strength, dimension, stability, and porosity formation of the composites (Razali et al. 2015; Huzaifah et al. 2017). Hence, low moisture content is required for product applications. Moreover, composites with high moisture content fibers may easily degrade due to retained water ((Rowell et al. 2000). From Fig. 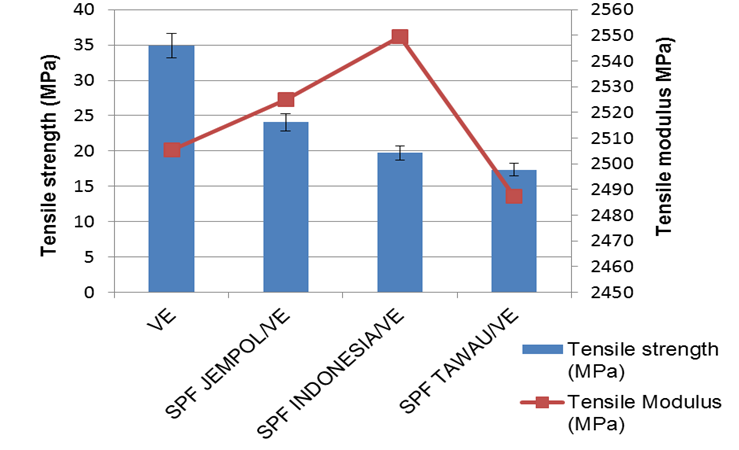 2, SPF Jempol/VE showed the highest moisture content (1.99%), followed by SPF Tawau/VE (1.86%) and SPF Indonesia/VE (1.80%). 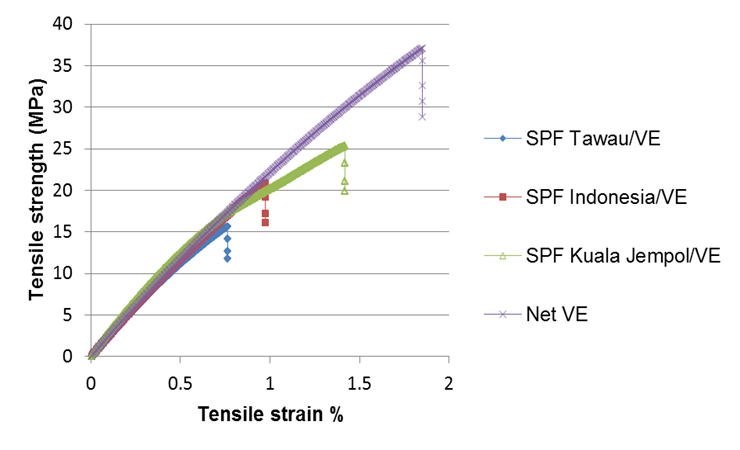 The SPF reinforced VE composites (Kuala Jempol, Tawau, and Indonesia) were evaluated, and their strength strain performance is shown in Fig. 4. The strength increased because of an increase of strain value and then underwent a failure at a certain point. According to Ishak et al. (2012), the defect may be associated with the weak strength of the fiber when the fiber was pulled under load or stress. Therefore, the fibers used as a reinforcement material for product manufacturing should have minimum defects. If not, the failures will start to occur at the defect point. The tensile properties were measured to evaluate the mechanical properties of SPF reinforced VE composites. The tensile strength and tensile modulus were investigated, and the results are shown in Fig. 5. The SPF Kuala Jempol/VE fiber had the highest average tensile strength at 24.06 MPa, while the SPF Tawau/VE and SPF Indonesia/VE fibers were 19.74 MPa and 17.37 MPa, respectively. These results were supported by previous research on single fiber tensile tests in which the Kuala Jempol fiber had the highest tensile strength, 233.28 ± 71.17 MPa while Indonesia and Tawau were 219.30 ± 79.71 MPa and 211.04 ± 81.19 MPa, respectively. The strength properties of natural fiber were influenced by cellulose content (Reddy and Yang 2005; Ishak et al. 2013a; Razali et al. 2015; Huzaifah et al. 2017). From the results of the cellulose content in Table 6, Kuala Jempol fiber had the highest cellulose content at 44.53%, while Indonesia and Tawau were 44.47% and 43.8%, respectively. The tensile modulus was used to measure the resistance of the material to elastic deformation under load. It is defined as the ratio of the stress (force per unit area) along an axis to the strain (the ratio of deformation over an initial length) along that axis over the range of stress in which Hooke’s law holds. As shown in Fig. 5, Tawau fiber had the highest average tensile modulus, 2549.54 MPa, while Kuala Jempol and Indonesia were 2525.04 MPa and 2487.45 MPa, respectively. Figure 6 shows the strength and modulus of SPF obtained from the three different geographical locations reinforced VE composites. The results show a similar trend with the tensile test where the strength and modulus increased with increased cellulose content. The SPF Jempol/VE had the highest flexural strength of 58.9 MPa and modulus values of 3177 MPa, which might been influenced by the adhesion and wettability between the fibers and matrix. The SPF Tawau/VE had the lowest value of strength and modulus (40.1 MPa and 2841 MPa, respectively), which might be attributed to the poor wetting of the fiber and matrix resin. All composites showed effective stress transfer and interaction effect between the fibers and matrix. Figure 7 shows the impact properties of SPF reinforced VE composites obtained from three different geographical locations. The introduction of fiber reduced the impact strength for all samples compared to the neat VE composites. This may have been caused from the fiber dispersal, which led to the local concentration point of pressure and weak interfacial adhesion. An example of this can be observed in Fig. 8, where some areas show a gap between the fibers and matrix. According to Nadlene et al. (2016), there are relationships between fiber-matrix interfacial adhesion and stress transferred from the impact force to the fiber through the matrix. 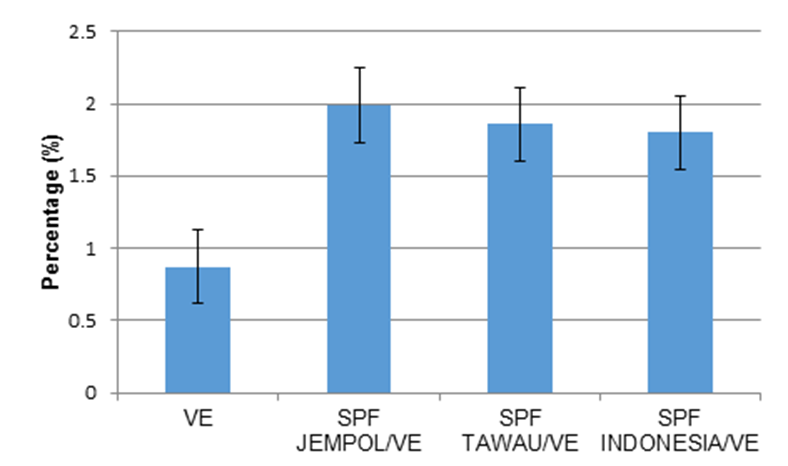 The highest impact strength of SPF reinforced VE composites were from Kuala Jempol, with a value of 7.72 kJ/m2, followed by SPF Indonesia/VE and SPF Tawau/VE with values of 6.27 kJ/m2 and 5.07 kJ/m2, respectively. SEM images in Fig. 8 show the overview of the structure of the composites made from SPF from Kuala Jempol, Tawau, and Indonesia. It can be seen that there were good interfacial bonding between matrix and fiber from Kuala Jempol (Fig. 8 a). As shown, the fiber was embedded firmly in the matrix. It is evidence for good tensile and flexural strength of the composites. Fiber pullouts and fiber breakage also can be seen in Fig. 8. This failure can lead to a decrease in mechanical strength of the composites. A limiting factor to using natural fibers as reinforcement in bio-composites is their low thermal stability. The TGA was carried out to analyse the resistance of natural fiber composites after exposure to several temperatures. In addition, this analysis was completed to ensure that natural fiber composites could endure certain levels of heat when applied for outdoor applications. Figures 9 and 10 present the TGA and DTG curves for neat VE and SPF/VE composites obtained from three geographical locations. There were no notable differences in the thermal degradation value of SPF composites obtained from the three locations. Overall, the SPF composites showed similar degradation trends. In addition, the results show that all SPF composites had thermal stability compared to the neat VE in the range of 370 °C to 420 °C. According to Huzaifah et al. (2017), there are four phases of thermal decomposition, which were moisture evaporation (45 °C to approximately 123 °C), then hemicellulose decomposition (210 °C to 300 °C), followed by cellulose (300 °C to 400 °C), and lignin (160 °C to 900 °C). The first phase of decomposition happened between the ranges of 30 °C to 100°C (Ishak et al. 2012; Nadlene et al. 2016; Huzaifah et al. 2017). All composites and neat VE showed a slight mass loss between the temperatures of 300 °C to 100 °C. According to Jumaidin et al. (2017), this occurs due to the presence of moisture in the composite structure, which indicates that natural fibers have a higher moisture content at lower onset and peak degradation temperatures. From the results obtained, the SPF Tawau/VE had the highest percentage of mass loss (11.01%), followed by SPF Jempol/VE and SPF Indonesia/VE (10.05% and 9.12%, respectively). The resulted mass loss comparably with the SPF moisture contents in previous research (Huzaifah et al. 2017). The second phase of decomposition was the hemicellulose decomposition that occurred between the ranges of 220 °C to 315 °C. According to Ishak et al. (2012) hemicelluloses have a heterogeneous polysaccharides structure that makes it for them to break apart at lower temperature. The cellulous decomposition takes place when the hemicellulose has completely decomposed, which typically happens at approximately 315 °C (Yang et al. 2007). Cellulose is more thermally stable than hemicellulose because it has a higher crystalline structure content of approximately 80%, which is the main reinforcement in the cell wall (Ho et al. 2012). For all of the SPF composites, the cellulose decomposition started at 350 °C and was completed at 420 °C. 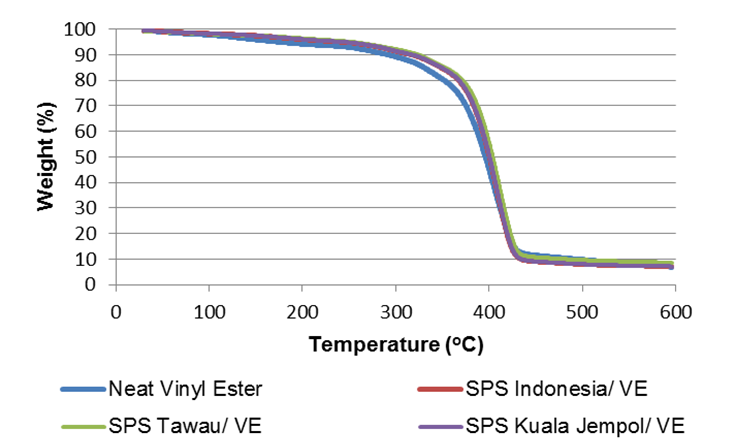 The peak temperature of the SPF cellulose structure was 410.8 °C, which was the fiber obtained from Tawau and the peak temperature of neat VE was 405.8 °C. The addition of fiber as reinforcement increased the thermal stability by 1.23%. Lignin is the last component to decompose because it has a relatively complex structure. According to Vanholme et al. (2010), the complexity is further explained by the presence of aromatic rings with various possible branches. The lignin decomposition begins early at 160 °C and decomposes slowly until the temperature reaches 900 °C to complete this process (Yang et al. 2007). Figure 8 shows that the lignin degraded slowly within the whole range of temperatures. It is hard to decompose a lignin structure due to its complexity, which makes it difficult to see an individual peak corresponding to lignin. According to Ross et al. (2008), the decomposition above 500 °C could be associated with carbonate decomposition. As the temperature is increased, the remains continue to decompose and cause the formation of char. From Table 5, approximately 8.57%, 8.01%, and 7.08% of the char was not completely for SPF Tawau/VE, SPF Jempol/VE, and SPF Indonesia/VE, respectively. The residue char was the end product after all uncertain substances were eliminated through the pyrolysis process (Razali et al. 2015). From the results displayed in Table 7, the use of SPF as a reinforcement material accelerates the degradation of VE composites. This may be due to the replacement of a portion of the VE matrix with thermally stable SPF, which can increase the thermal stability of the polymer system as a whole. Ray et al. (2004) and Yusriah et al. (2016) agreed that the individual thermal degradation properties of the matrix and fibers influence the thermal degradation properties of natural fiber reinforced polymer composites. Results from the physical properties found that SPF Jempol/VE showed the highest value of water absorption and moisture content. Mechanical testing of the SPF composites on tensile, flexural, and impact strength also showed that SPF Jempol had the highest tensile, flexural, and impact strength compared to the composites reinforced by SPF from Tawau and Indonesia. For thermal properties, SPF/Tawau had the highest mass loss and no notable difference between the other composites. There were only slight differences in physical, mechanical, and thermal properties of SPF obtained from different geographical locations reinforced VE composites compared to other established natural fiber composites. The authors thank Universiti Putra Malaysia for funding the research grant (HiCoE 6369107). In addition, a special thanks to the Institute of Tropical Forestry and Forest Products, Universiti Putra Malaysia for providing facilities to carry out the experiment. The authors would also like to thank University Putra Malaysia for funding the Master of Science degree for the principle author under a grant research fellowship (GRF). ASTM D 256-97 (2002). “Standard test methods for determining the Izod pendulum impact resistance of plastics,” ASTM International, West Conshohocken, USA. ASTM D 790-10 (2010). “Standard test method for flexural properties of unreinforced and reinforced plastics and electrical insulating materials,” ASTM International, West Conshohocken, USA. ASTM D 5083-02 (2002). “Standard test method for tensile properties of reinforced thermosetting plastics using straight-sided specimens,” ASTM International, West Conshohocken, USA. Climate Data (2015a). “Climate: Tawau,” (https://en.climate-data.org/location/5121/), accessed on February 2, 2018. Climate Data (2015b). “Climate: Tasikmalaya,” (https://en.climate-data.org/location/975258/), accessed on February 2, 2018. Climate Data (2015c). “Climate: Kuala Pilah,” (https://en.climate-data.org/location/26002/), accessed on February 2, 2018. Husni, A., Shariff, M., and Zakaria, M. (1990). “Soil and foliar nutrient relationship in selected Shorea and Koompassia species in two forest reserves, Peninsular Malaysia,” Journal of Tropical Forest Science 2(4), 320-330. Ishak, M. R., Leman, Z., Sapuan, S. M., Salleh, M. Y., and Misri, S. (2009). “The effect of sea water treatment on the impact and flexural strength of sugar palm fiber reinforced epoxy composites,” International Journal of Mechanical and Materials Engineering 4(3), 316-320. Kharisun, and Budiono, M. N. (2015). “Effects of natural zeolite and urea on NH 3 emission and nitrogen uptake in rice soils,” in: Proceedings of International Conference : Integrated Solution to Overcome the Climate Change Impact on Coastal Area Semarang, Indonesia, Semarang, Indonesia, pp. 1-7. Ku, H., Wang, H., Pattarachaiyakoop, N., and Trada, M. (2011). “A review on the tensile properties of natural fiber reinforced polymer composites,” Composites Part B: Engineering 42(4), 85-873. DOI: 10.1016/j.compositesb.2011.01.010. Leman, Z., Sastra, H. Y., Sapuan, S. M., Hamdan, M. M., and Maleque, M. A. (2005). “Study on impact properties of Arenga pinnata fiber reinforced epoxy composites,” Jurnal Teknologi Terpakai 3, 14-19. Nguong, C. W., Lee, S. N. B., and Sujan, D. (2013). “A review on natural fiber reinforced polymer composites,” International Journal of Materials and Metallurgical Engineering 7(1), 52-59. Rowell, R. M., Han, J. S., and Rowell, J. S. (2000). “Characterization and factors effecting fiber properties,” in: Natural Polymers and Agrofibers Based Composites, E. Frollini, A. L. Leao, and L. H. C. Mattoso (eds. ), Sao Carlos: Embrapa Instrumentacao Agropecuaria, Sao Carlos, Brazil, pp. 115-135. Sahari, J., Sapuan, S. M., Zainudin, E. S., and Maleque, M. A. (2012b). 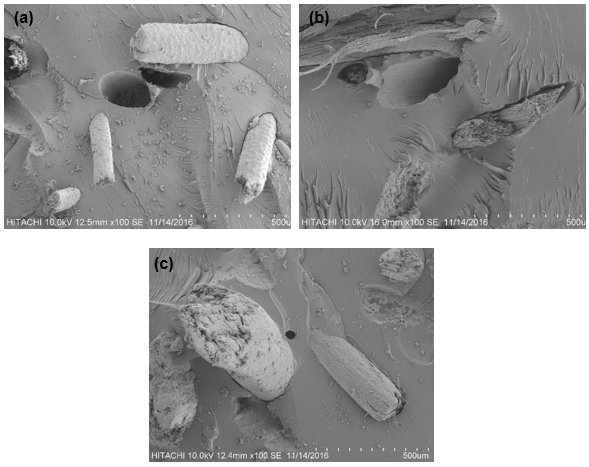 “Sugar palm tree: A versatile plant and novel source for biofibers, biomatrices, and biocomposites,” Polymers from Renewable Resources 3(2), 61-78. Suriani, M. J., Hamdan, M. M., Sastra, H. Y., and Sapuan, S. M. (2007). “Study of interfacial adhesion of tensile specimens of Arenga pinnata fiber reinforced composites,” Multidiscipline Modeling in Materials and Structures 3(2), 213-224. Weather Spark (2017a). “Average weather in Kuala Pilah, Malaysia, year round,” (https://weatherspark.com/y/114181/Average-Weather-in-Kuala-Pilah-Malaysia-Year- Round), accessed on 22 October 2017. Weather Spark (2017b). “Average weather in Tasikmalaya, Indonesia, year round,” (https://weatherspark.com/y/119637/Average-Weather-in-Tasikmalaya-Indonesia- Year-Round), accessed on 22 October 2017. Weather Spark (2017c). “Average weather in Tawau, Malaysia, year round,” (https://weatherspark.com/y/131278/Average-Weather-in-Tawau-Malaysia-Year- Round), accessed on 22 October 2017. Article submitted: June 29, 2018; Peer review completed: September 17, 2018; Revised version received: November 5, 2018; Accepted: November 22, 2018; Published: November 30, 2018.